This spacious and modern two bedroom apartment in Barcelona, located in the Poble Sec neighborhood, is a wonderful choice for those looking to make the most of their time in the Catalan capital. Slightly quieter than the bustling city center, this area is ideal for those who want to retreat to a calmer area at the end of the day. 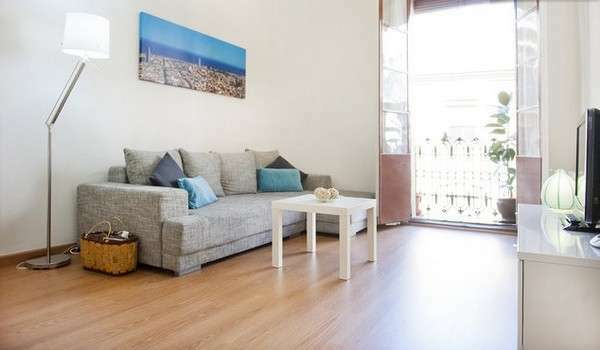 Able to accommodate up to six people, this apartment is a top choice for families or groups of friends visiting Barcelona. Visitors are sure to feel right at home in this chic, yet comfy apartment. The living room has a comfy double sofa bed, and a TV, ideal for kicking back after a day of sightseeing. An Internet connection is also available, making it easy to stay in touch with loved ones back home. The main bedroom is furnished with a double bed, while the second room has two single beds. Be sure to take advantage of the well equipped kitchen as you prepare your favorite home-cooked meals, or even try your hand at some Mediterranean-inspired dishes. Ideal for those in search of a welcoming place to call home during their time in Barcelona, this contemporary apartment is a great choice!